Al meets a drummer...and another one rides the bus. Should Al and the band have rerecorded "Another One Rides The Bus" for the debut album, a la "My Bologna?" Oh yeah! Adding bass and guitar would have made that song ten times better! Nope! The song was already perfect with just an accordion and case! The 1980s weren't exactly starting off very well for Al. Although Christmas, 1979 saw the release of Al's first single, "My Bologna," his six-month contract with Capitol Records had ended without producing a follow-up, or much success for that matter. Al was already back to work on getting his college degree in architecture when he was invited to be a guest on the live Dr. Demento Show in September 1980. This episode was looking back at the various aspiring musicians who had sent tapes to the show over the years, and the Good Doctor invited Al down to recount his experiences doing that. Also on the show was another songster named Jon Schwartz, who had recorded such songs with his friends as "The Woodsy Owl Song." During a commercial break, Al informed everyone that he had been working on a brand-new parody that he would like to premiere during his interview. The original EP release of "Bus" on Al's "label" Placebo Records. Oddly enough, an actual record label has formed in recent years using that intentionally phony moniker. Everyone at the studio pitched in to help perform Al's new song. Jon volunteered his abilities as a drummer, so Al quickly handed over his empty accordion case for Jon to bang on. Dr. Demento even made sure that he had a tape rolling to capture the live performance. After a quick rehearsal, everyone was ready. With a couple of repeated notes on the accordion, Al launched into a clever, yet rather simple, parody of the recent Queen hit "Another One Bites The Dust." Al's parody, "Another One Rides The Bus," chronicled an unfortunate overcrowded adventure on public transportation. Jon pounded in beat as others around the studio blew into kazoos and duck calls, clapped, and sang back-up. "Bus" became an instant hit on the show, and in fact Dr. Demento's syndicator was able to pick up a few more stations around the country just because people wanted to hear that song! 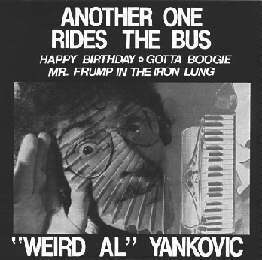 As popular as Al already was with Dr. Demento listeners, "Bus" exposed him--ever so slightly, of course--to mainstream-music listeners, while the song itself was propelled to that important status of "cult hit," something Al would have quite a number of throughout his career. Al was able to borrow some money to self-produce an extended-play single of "Bus" in January 1981, shortly before doomed disco label TK Records agreed to release the song nationally. The single made the rounds on the radio, even earning a spot on the Billboard singles chart! The continued cult following of "Bus" even led to Al and Jon performing the song on NBC's Tomorrow Show, the first time either had been on national television. Although TK Records soon went out of business and it would be another two years before an Al recording would be released on vinyl, "Bus" helped lay the groundwork for what was to come. The song continued to be a smash hit on The Dr. Demento Show, so DrD asked Al to be his musical guest for a number of public appearances. It was at one such show in Phoenix that Al met entertainment agent Jay Levey, who has managed Al's career ever since. In addition to the creation of one of his earliest hits, that spirited night in September 1980 also forged Al's long-standing partnership and friendship with Jon, who would go on to provide drumming and percussion for every Al project since. Dubbed "Bermuda," Jon would not only be the first piece of the puzzle in forming Al's band, but he would also become Al's archivist, fan liaison, and in 1997 official webmaster. So although the first eight months of the 1980s weren't especially kind to Al, the seeds were soon planted that would make him one of the decade's most recognizable musicians.